« You Got Trumped! Trump tax plan taxing for the maestro of negotiation? The big announcement of the really, really big Trump Tax Plan with the “biggest tax cuts in history” came out bigly on Wednesday, as Trump promised. Treasury Secretary Steven Mnuchin and National Economic Council Director Gary Cohn, Trump’s latest tax team, beamed proudly as they presented their baby. The stock market took a deep breath, then looked at their brainchild and completely petered out. First, let me say, I clearly have nothing to recant from my earlier predictions about Trump’s tax plan. The plan that came out looks almost exactly as I thought it would — the only difference being that it is far more pathetic. Ah, but that was this afternoon, and now it is the evening after the market plunged as steeply as it soared (and twice as far) to finish the day with the Dow slightly down from its pre-tax open — a sign of a mercurial market that was, for an instant pleased, until it started to feel a little indigestion from consuming its dinner too quickly. At that point, it barfed up all its gains for the day and went to bed sour. What the White House billed in its release as “the biggest tax cut in history” rapidly turned into digestive gas. As I speculated earlier in the day, no real plan was released. Just gas. 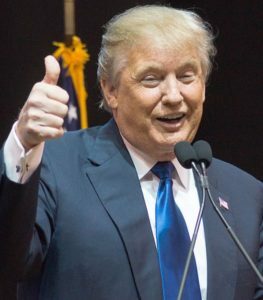 Once again the Trumpet blew his horn loudly (probably from his back side) as he released the big plan, and then his team turned out a summary statement, devoid of any details or calculations. It does help some of the middle-class by doubling the standard deduction for married couples, and it maintains the allowance for charitable deductions, and it says it will allow tax relief for childcare expenses (though, again, without any details). Wouldn’t you know it? The one part where the devil always rests is still cloaked under a sheet to be revealed at some vague later date. 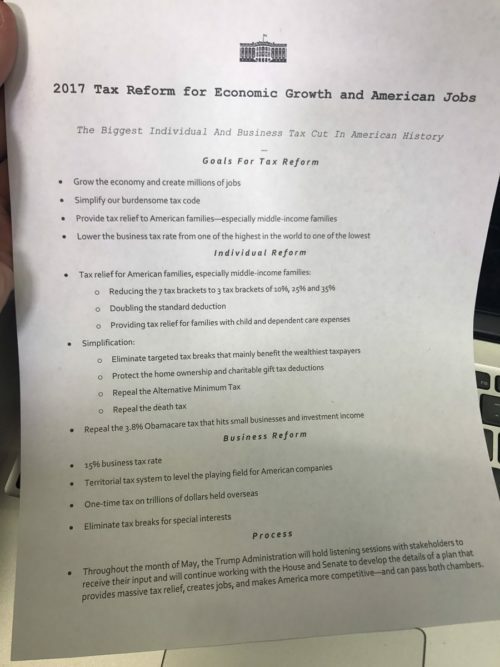 Written on all of one side of one page, the newly Trumped-up Tax Plan looks like a scheme worked out by a couple of guys in a paneled club room, smoking cigars over whisky on the rocks and deciding what sounds “great.” That’s clearly why the US stock market plunged once the cigar smoke cleared so investors could actually see the Trumped-up Tax Plan … and the napkin it was written on. How pathetic is that plan when it gives the “biggest tax cuts in history” all aimed at pumping up the stock market, and all its coming-out accomplishes is to cause the stock market to slump in disappointment? Talk about an anti-climax. Where we got Trumped on this plan was in thinking a plan might actually be coming out today! Hah! Silly us! It’s more of a promissory note, really. I’ve seen footnotes larger than this plan. What we got today was, again, nothing more than just talk! Talk about what Team Trump WILL do … whenever it is that it finally does it. They’ve managed to finish a one-page outline. I think the market rose when it heard general statements about the plan, then plunged all the way to closing when it saw that it was written with lots of white space and NO detail on one page. What the market first thought were summary statements introducing the plan, actually are the plan. Great work for your first hundred days, Boys! Read my last article, “You Got Trumped! Trump tax plan taxing for the maestro of negotiation?” and you’ll see I sure called this one. If there is anything that has gotten to be predictable about Trump, it’s that he’s all talk all the time. He’s appropriately named after his loud and brassy mouth. Now, if he can just get his band of merry boys to orchestrate a tune. Trump promised the plan would be beautiful, and it is that; it’s written on a lovely piece of paper — very high quality like the menu at Mar-A-Lago — in an attractive font. It’s a thing of beauty. You should see it. Really, you should see it. I think it even has a picture of chocolate cake on it! Hmm. I’m thinkin’ they will. They’re like that. This is a dream plan only in the sense that the White House is dreaming if they think this is going to become a bill that revises the whole tax code without Democrat involvement. But, who would have thought that tax reform could be so difficult? Right? It’s so full of vague platitudes or catch phrases that it’s practically a tax cliché. In other words, it is a plan to start creating a plan! And you thought I was just joking about how vague and utterly deplete of details this so-called plan is! After six months of poring over the details and laboring late into the nights, this fourth rendition of Trump’s plan is not that different from what he presented during the campaign, and it’s equal in depth of thought and detail to the kind of outline you come up with after a day of brainstorming and sorting out the the most-liked ideas. Now that Team Trump has done all the heavy lifting, it falls to congress to turn this masterplan into months of argument and volumes of law. I knew it was going to be pathetic; I didn’t know it was going to be deplorable.